In a document in the Lilleshall Chartulary recording a sitting of the Justiciars of King Henry II at Salop on Wednesday, February 8, 1189 a fine was levied between Stephen de Pimbelg and the Abbot of Lilleshall relating to a suit over a Bosc in Hennechot and Pimbleg. [Note: I have not seen the primary source, but I suspect the 'g' in 'Pimbleg' is actually the letter yogh. (clamuim) between the Abbot and Stephen." Primary source: Lilleshall Chartulary, fo.82. Secondary source: Eyton, R.W., Antiquities of Shropshire, Vol VI, John Russell Smith, London, 1858, pp 368-369. 1189-1221 Stephen de Pimbelg, de Pimbel or de Pimley son of Unerard de Midelton. In a section concerning the early history of Pimley in Shropshire, in the period 1189 to 1221, mention is made of Stephen, son of Unerard de Midelton, whose surname is variously de Sidenun, de Pymbelg, de, Pimbel, de Pimbelee, de Pimbeleg, de Pimbileg. Stephen's son William is mentioned as succeeding him. This William had sons Geoffrey and William by different wives. Geoffrey was apparently illegally disinherited and there is mention of ensuing litigation involving his brother, William. This secondary source mentions a host of documents covering the period 1189 to 1256 that refer to Stephen and his descendants but I have not tracked down references to the originals yet. Secondary source: Eyton, R.W., Antiquities of Shropshire, Vol VII, John Russell Smith, London, 1858, pp 303-308.
c.1224 Stephen de Pimbel, Witness to a Deed, Stoke upon Tern, Shropshire. Secondary source: Eyton, R.W., Antiquities of Shropshire, Vol VIII, John Russell Smith, London, 1859, p 62. 1255 Geoffrey de Pembeleg, Lord of Pembeleg. "Geoffrey de Pembeleg is Lord of Pembeleg, and holds it of the Abbot of Salop for 5s. per annum." Primary source: Bradford Hundred Roll, 1255, Rot. Hundred, II. 57. Secondary source: Eyton, R.W., Antiquities of Shropshire, Vol VII, John Russell Smith, London, 1858, p 307. 1339 Roger Pymbyl, Beneficed Clergyman, Wrentham. Primary source: Institution Book 1325-1343, Norwich Diocesan Archives, Norfolk Record Office DN/REG 1 books 2 & 3, indexed at MC 16/4, 390X2 and index volume DN/REG 17. Microfilmed MF 507. 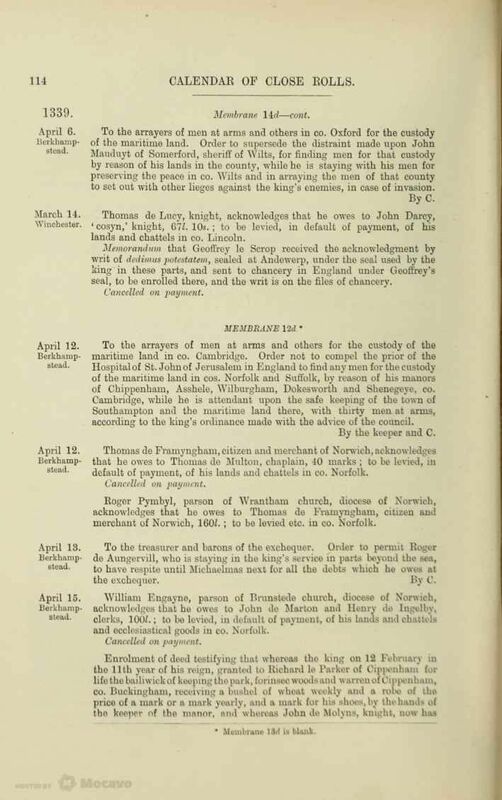 Secondary source: Morley, Claude, "Catalogue of Beneficed Clergy of Suffolk, 1086-1550" in Suffolk Institute of Archaeology and Natural History. Officers and Reports, Etc. for Year Ending December 31st, 1934, W.E. Harrison & Sons, Ipswich, , p70. 1339 Roger Pymbyl, Parson of Wrantham Church, Norwich. merchant of Norwich, 160l. ; to be levied etc. in co. Norfolk." Secondary source: Calendar of the Close Rolls Preserved in the Public Record Office 1901 p114. 1353 Roger Pymbel, Rector of Edingthorp, Norfolk. "1349, William de Boxgrave, by the lady Joan de Barr, Countess of Warren." "1353, Roger Pymbel, presented by the attorney of the lady Joan." Secondary source: Parkin, Charles, An Essay Towards a Topographical History of the County of Norfolk..., Volume XI, William Miller, London, 1810, p29. From the translation of Higden's Polychronicon by John de Trevisa completed in 1387. "Þis ryver Dee eorneth j cometh out of þe lake þat hatte Pimbil-mere. Yn þe ryver is gret penté of samon, noþeles in the lake ys never samon yfounde." eorne - to run, hatte - is called or named. Secondary source: Morris, Richard, Specimens of Early English: selected from the chief English Authors A.D. 1250 - A.D. 1400, Clarendon Press, Oxford, 1867, p337.